A whispered voice calls from a coffin bound in chains, urging the heroes into the depths of the Shudder Mountains, a place rife with superstition and forlorn secrets. In the shadowy, pine-grown valleys of the Deep Hollows lurk mysteries of a bygone age and a new evil emerging from the ruins of the past. The adventurers must plumb the mountains' secluded reaches to root out this rising terror before its power comes to fruition. Standing in their path are cackling witches, subtle devils, lingering spirits, and a foul thing that moves in the night. 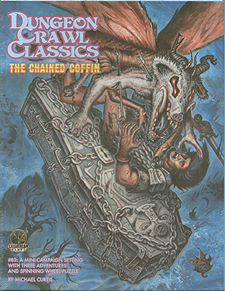 Can the heroes appease that which lies within the Chained Coffin and thwart the dawn of a new and terrible age? An 11" x 17" hex map of the Shudder Mountains region.